Once you're confident with the basic method, you can get creative. This version is delicately crisp on the outside with pockets of toasted nuttiness and cocoa swirls. The curd makes a sublimely tangy filling. Preheat the oven to 150°C, gas mark 2 (reducing it for a fan oven). Line two oiled, round, loose-bottomed, 20cm cake tins with baking parchment. Whisk the eggs with the cream of tartar on low, building up the speed and, once stiff, start adding the sugar 3 tbsps at a time, whisking in after each addition. Add the vinegar with the last of the sugar. Once the mix is thick and moussey, sieve over most of the cocoa and add two thirds of the nuts. Gently fold through. Divide between the two tins, making one peaky. Sieve over the remaining cocoa and sprinkle the nuts on this cake. Put the cakes on a middle shelf in the oven and bake for 45-55 minutes till lightly golden. Let them cool in their tins. Place upside down on a tea towel to peel off the parchment. Whip the cream and spread on the base. 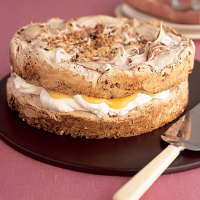 Drizzle with curd and top with the other meringue. The finished cake makes an elegant end to any meal or even a deliciously different birthday cake.